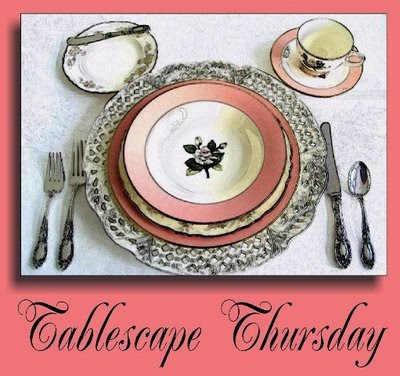 This Tablescape Thursday (go here to see other tablescapes from "Between Naps on the Porch") is dedicated to some of my very dear friends that are going through a really hard time in life right now! We can be reminded that God never leaves us, even in the valley! 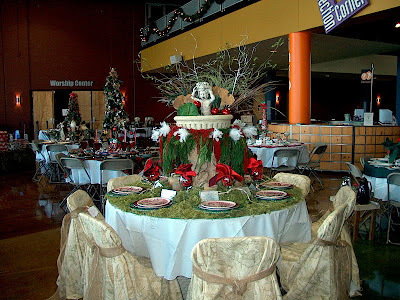 I did this tablescape about 5 years ago for a Christmas Dinner. The theme was "The Lord is my Shepherd"
I placed a fountain in the center of the table so you could hear the water running, it was so peaceful! I had large floating ornaments in the water and they shimmered and sparkled. I placed green moss all over the table top. The table cloths were provided so I didn't have the opportunity to iron it (sorry the perfectionist coming out of me). I Draped live Christmas tree clippings around the fountain with white feather's to create some whimsy. The red moss really brought it all together and coordinated with the plates and napkins. I placed the fountain on a small garden column so it had some grandeur. I spray painted branches from my backyard with white and silver spray paint and added sparkles after I spray painted them. They were placed behind the angel in the fountain to create height. I also put in some old bark pieces, moss and lily pads. I wish I had more close up pictures but you can get the idea. Williams Sonoma. 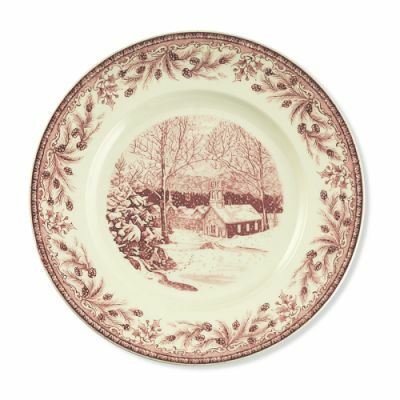 I LOVE these plates and would love get the napkins this year for Christmas! Each person got Psalm 23rd in a frame to take home with them. I had a bolt of fabric that I used to cover the chairs and tied burlap strips around each one as the finishing touch. My guests at the table said it was fun to experience what Psalm 23 says by hearing flowing water and being surrounded by the green grass. It created great discussion between my guests. We probably memorized this verse sometime in our childhood at church camp or VBS, but somehow it has new meaning depending on what you have going on in your life. God is constantly speaking to us through his words and I love that! GOD'S LOVE STILL STANDS WHEN ALL ELSE HAS FALLEN! If you are going through a hard time right now, I hope these words encouraged you!